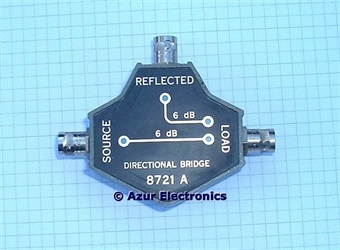 The HP 8721A Directional Bridge is used for making transmission and reflection measurements from 100kHz to 110MHz. It is intended for use with the HP 8601A Generator Sweeper and the HP 8407A Network Analyser. The original cost was $200 in 1980 and was part of the 11652A Reflection Transmission Kit which cost $475 in 1980. A HP Manual was downloaded from the web. On one side, connections for Reflection measurements. Functionally similar to a directional coupler. On the other side, connections for Power Monitoring. Functionally similar to a power splitter. Bought the unit (no S/N) on eBay FR. Initial tests are ok. 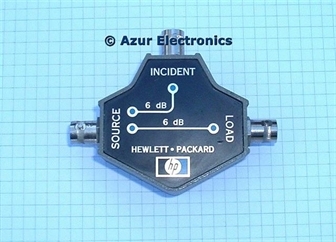 Measurement techniques are described in the HP 8721A Manual and the HP Application Note 121-1 "RF Network Analysis with the HP 8407A".